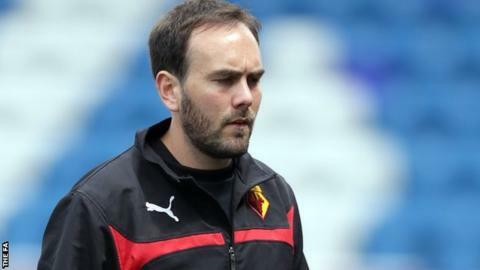 Watford Ladies manager John Salomon is to leave the club at the end of the Women's Super League Two season. The 30-year-old, who has been in charge since 2011, has also spent the past two years as general manager. He will take charge of Watford's last game of the season, at home to London Bees on Sunday, before starting a new role with the Football Association. Salomon's side, who are without a home league win in 2015, lie bottom of WSL 2 with four points from 17 games so far. "I've been proud to work for the club I have supported all my life and it was always going to be a difficult decision to leave," Salomon told the club website. The crowd of 1,102 for Watford Ladies' first game at Vicarage Road against Aston Villa earlier this season was a club record. "When I took over as first-team manager we set a series of targets with our main focus set on becoming a WSL team. "We achieved that and the challenge for the club now is to become more competitive at that level. "I'm confident that we'll see the club continue to progress in the coming years both on and off the pitch. "I'd like to thank everyone who has been a part of this journey and wish everyone connected to the club the very best for the future."